Varicose Veins are larger veins that are often visible as “ropes” or collections of bumpy veins on the leg. They are larger than reticular veins and are oftentimes associated with aching, heaviness, itching, burning, cramping at night, or the sensation of swelling in the leg. Varicose veins form when valves in the leg veins stop working. These valves normally stop blood from going backward down the leg on its way to the heart. 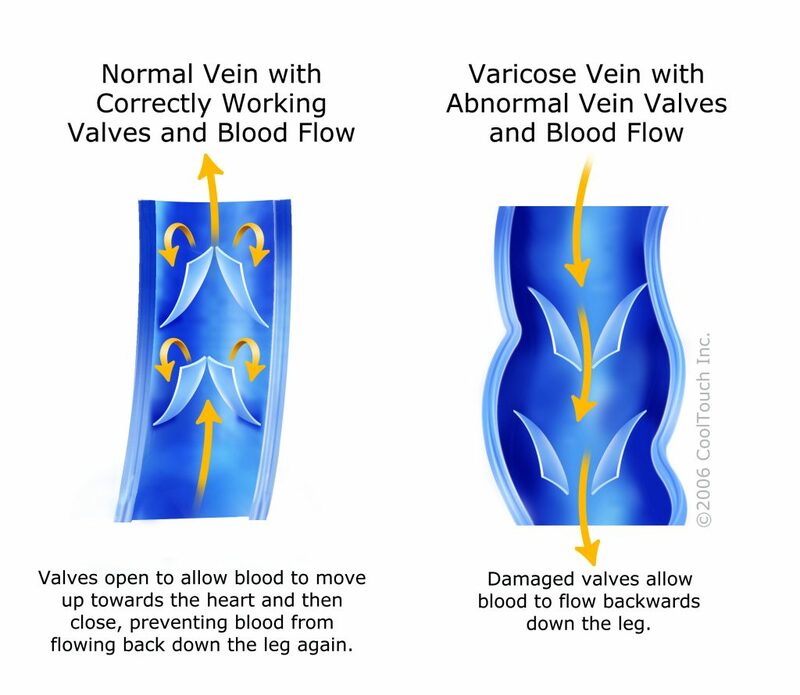 If the valve is not working properly the blood goes back down the leg toward the foot and causes dilation in the veins and pooling of blood in the vein behind the valve. The ropey veins are a result of this type of pooling and dilation. Varicose veins indicate venous disease is present in the leg and if left untreated the condition may progress or worsen. The type of varicose vein treatment chosen depends on many factors of the varicose vein including its location, severity, associated symptoms, and the degree of disease present. A thorough examination, including conclusive diagnostic techniques will be utilized to help Dr Spartz and clinic at Roseville near the Twin Cities of Minneapolis and St Paul make recommendations for the appropriate treatment of your varicose veins. The varicose vein treatment options may include conservative treatment with compression stockings, sclerotherapy, endovenous laser ablation, or microphlebectomy. Conservative varicose vein treatment includes exercise, maintaining a healthy weight, avoiding long periods of uninterrupted sitting or standing, elevation and compression stockings. Compression stockings provide added squeeze to the calf veins to help blood move in the correct direction toward the heart. When they are sized properly, are the correct prescription pressure, and worn regularly they are a very effective treatment. Compression stockings are used for a time after other vein treatments including sclerotherapy, microphlebectomy, and endovenous laser ablation. Sclerotherapy is the practice of injecting an irritant into the diseased vein to promote disruption to the inner layer of the vein wall which leads to its collapse, resorption and elimination. Sclerotherapy can be done in several manners depending on the size and depth of the vein that is being treated. A special vein light is sometimes used. This device is held to the skin over the treatment area and illuminates the tissues and diseased veins under the skin to highlight the veins which may be feeding into spider veins or reticular veins. For veins that cannot be seen with the naked eye or the vein light, ultrasound is used to provide guidance and accuracy when injecting into diseased veins. Endovenous laser ablation is used for specific larger superficial diseased veins. This is a minimally invasive technique which has largely replaced vein stripping procedures and become the new standard of superior treatment for eliminating varicose veins and their symptoms. It is safely performed in an office setting and using only local anesthetic. After the varicose vein treatment, patients are able to go home right after the procedure and go back to work the next day with minimal restrictions. Microphlebectomyis an option for patients with large ropey veins near the surface of the skin. Small incisions are made along the path of the ropey vein and the vein is removed in specific sections through the incisions. The skin is numbed along the path of treatment and the incisions are so small that are usually closed with medical tape alone. This procedure can produce very nice cosmetic results but is not always necessary. Patients often find that after treating the underlying venous disease the ropey veins will shrink considerably. If there are still perceptible varicose veins following endovenous laser ablation another option is the less invasive sclerotherapy.